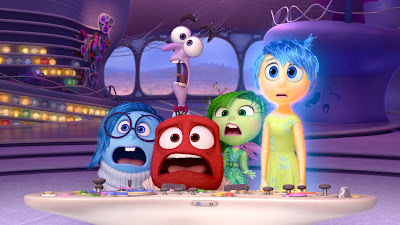 I knew, based on the preview I saw months ago, that I was going to ugly cry during "Inside Out." I mean, come on, it's literally a movie about ALL THE FEELINGS. And I have so many feelings. And the tagline is "Meet the Little Voices Inside Your Head." And the name of my blog is My Inside Voices. And it's about an 11-year-old girl struggling with change and the complications of growing up when her families moves from Minnesota to San Francisco. And I've long been convinced that my life peaked right around 11 or 12. And it's about the memories we form as children and how we carry them (or lose them) as we grow older. And I have the wonderful/terrible duty of directly impacting the happy, heartbreaking, terrifying, infuriating, regrettable memories of two small humans. And it's a such a huge job and I often feel that I'm failing at it. What if there just isn't enough joy on the shelf to get them through the rigors of adolescence? Predictably, I was crying within the first five minutes. But I was also laughing. Because Amy Poehler is Joy and Lewis Black is Anger and Bill Hader is Fear and Mindy Kaling is disgust and they're all hilarious – even when they're just voices embodied by colorful blobs of emotion. And then I was cry-laughing. Like when Sadness (voiced by the show-stealing Phyllis Smith of "The Office" fame) says "Crying helps me slow down and obsess over the weight of life's problems" because it is so scarily spot-on I felt a little bit inside out myself sitting there in the movie theater. For 94 minutes the writers of "Disney Pixar's Inside Out" were the puppeteers of my emotions – they'd tug at my heart as newborn Riley opens her eyes and sees the smiling faces of her parents for the first time and then shake my funny bone as toddler Riley goes streaking through the living room naked in full on Goofy mode (a near nightly occurrence at our house). Emotions aside, it was fascinating to see the inner workings of the brain as interpreted by writers and animators. The sequence of how dreams are staged was fantastic (thanks in part to a super aloof Rainbow Unicorn) and made a dream I had last night about a literary agent calling me to discuss my manuscript even more amusing. "Is this Susan?" she asked in a faraway voice, the cell phone she was calling from going in and out of service. "We just finished your book. It was alright. Not bad. Did you want us to glance over a second draft?" And I had to frantically remember whether a second draft even existed (it didn't) because I figured having her "glance over" the book again would bump up her "not bad" assessment to "pretty good." When I woke up this morning I had to laugh. Even in my wildest dreams, the news is still just "Eh, we could take it or leave it." And that seems to be the thesis of the movie. When we're little, Joy runs the ship and all our memories, even our bad memories seem to glow. But then we get older, and Sadness takes the wheel more and more. And all the sudden all that glittered in youth turns blue as Sadness slumps about tainting everything with melancholy. Life goes from super awesome to just pretty good. And even when we experience those moments of super awesome as an adult, it seems they're always shadowed by self-doubt and worry and stress. This realization only made me cry more because I was watching the girls watch the movie and, like Joy, wanted desperately to slow (or even stop!) the progression of Sadness in their lives. But how can I keep Sadness in her little circle so that Lily will continue leaping around the house in her Bambi costume from Halloween and Jovie will continue to celebrate pooping on the potty by analyzing the shape of each deposit ("That one looks like a sandwich!") and asking for "lemon-nems" (M&Ms)? But the transition feels all but inevitable. This was made even more clear when I looked over at Lily during a part of the movie when Joy and Riley's imaginary friend Bing Bong are trying desperately to get out of the Memory Dump. I was already crying (again) and, as I predicted, Lily was bawling. "Mom, can we go to Buffalo Wild Wings now?" she sobbed – we'd planned to take Brad there for a Father's Day dinner after the movie. And I asked the obvious question. "Is this making you sad?" And Lily nodded vigorously. And I told her we should stay just a little longer, because I was sure the movie would become happy again, and that we didn't want to miss it. And she agreed – somewhat reluctantly. Because it's part Disney, we got our happy ending. Though I'm not quite sure why it was happy. I mean, is it really, truly a happy ending if the resolution is that Joy realizes she needs to make room for Sadness? It validated me, as an adult. But Lily, well. I'm not so sure. "No," she whispered back. "I like Disgust. She's so pretty!" Sigh. I need to stop overthinking things. Inside Out is the first psychological thriller that's fun for the whole family. Really psychological. And really fun.